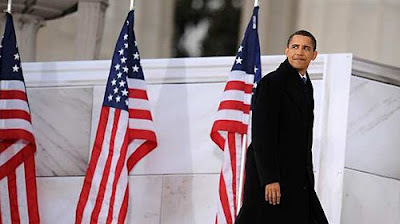 Inauguration Day 2009. I am standing here watching history happen before my eyes. Barack Obama has been elected the 44th President of the United States ... our very first African American President. He just made his appearance and I'm waiting for my goosebumps to subside as he prepares to take his oath. No matter who we all voted for, I hope we can all come together to honor our President of the United States. We all know the economy has gone downhill the past few years, so let's hope there are only good things to come. Yes, I hope everyone's faith in the greatness and humanity of our nation is renewed. It is a great day indeed! That's such an amazing picture. What a great day.